If you’re interested in a good synopsis of what keeps glaciologists awake at night, this is worth your time this weekend. Add the videos I’ve plugged in here, and you’ll be well informed. The results were dramatic. The new processes combined to have a huge impact. Instead of about 2 meters of sea level rise, Antarctica lost enough ice to raise global sea level 17 meters over several thousand years. 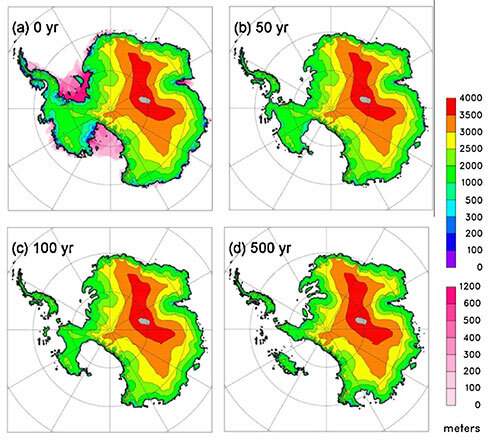 The fragile West Antarctic Ice Sheet collapses in a matter of decades, rather than centuries or millennia. There’s 5 meters of sea level rise in the first two centuries, after which retreat in portions of the East Antarctic Ice Sheet really get going. Much more work will be required to make sure these new processes are being simulated accurately, but the early returns show it could put researchers in the ballpark of solving the puzzle of past high sea levels. Thanks. The second article explains what I had been wondering about for a long time, i.e. the many remains of human settlements under the sea, fairly close to the present shores. I certainly get why Thwaites [& Pine Island] “…keep[s] glaciologists awake at night”, but I’m a little confused as to how bad this could be. If both glaciers dissolve into the sea, would it affect only lands bordering the oceans or would it also cover major inland cities/lands? If so, to what degree? most major cities are located on coasts. also, most of the world’s most productive agricultural regions are low lying, think Nile and Mekong delta. If people have no place to live, no food to eat, they will move. Current political turmoil in mideast and Europe in part a product of just a few million people on the move. Shortsightedly, I was primarily thinking of how much land would be uninhabitable. Migration of hundreds of millions of peoples is almost beyond comprehension. One of your best posts. Excellent. Having seen what is happening in Miami, Bangladesh, Virginia and the East Coast (US), it is becoming very, very unsettling as to what residents can do, especially in the future. Collins Ave in Miami has a foot of water on it at high tides. Shorecrest is inundated regularly with septics discharging into the salt water flooding. The most frightening aspect of this is that it’s an attitude of “Oh, well, we’ll adapt.” To the tune of hundreds of millions of dollars. The causeways to the Carolinas outer islands are covered in saltwater at king tides. Brooklyn is experiencing flooding. Virginia shore neighborhoods have streets awash at high tides. What is particularly galling is this: THIS IS ONLY THE BEGINNING. Our government and leaders are soundly asleep at the switch. Add to this the increase in wildfires, exacerbated droughts and floods (Lake Powell, fed by the Colorado River is HALF EMPTY.) and the future looks very uncertain. We are messing with planetary changes that will easily whelm us and very likely overwhelm us. To the deniers & skeptics: What if you are wrong?? Will you indemnify us? Not bloody likely is it? Coal, oil and gas is not doing anything of note as regards the flooding above. I do know this won’t affect me as much as it will my kids, grand-kids and their offspring. Who will compensate them for a huge encroaching struggle and loss? We must all do our part to fight this pernicious laissez-faire attitude.